ISBoxer.com • View topic - Action menu bar. bob wrote: What does the debug console show when you use your new menu? omg lol so much headache ok so now it kind of work but what happen is when I click MY NEW MENU( action key) both of my char cast at the same time. and my Standard action key doesnt seem to work at all. I dont want it to do that. I only want 1 char per action key. it seem like both of my action key is over lap but it is not at all. i clearly see that they are seperate. this is what i see for both of my alt account when my click the button from my main. I am sorry it look like I screw up on the making the second action key i am not a programmer all i know is copy and paste. Last edited by Noodlefaces on Tue Aug 25, 2015 10:03 pm, edited 1 time in total. And again, what do you get when you click on your NEW MENU. The debug lists are clearly NOT showing ALT+0 or ALT+= as these would show up with 164+0 or 164+=. To me it seems like you are clicking on the initial menu and expecting it to do something different. It wont. Your new green box menu, is defaulting to the same initial location as the Standard menu, so if you have not changed the location of the Standard menu, then this would explain it. When you set the key combination on the alt key Button Set, there was also a dropdown for the Target. This was set to "Window: All w/ Current", or in other words, All game windows. If you only want it to go to a specific game window, you can change the Target to the game window you want, whether specified by Character, or Slot (which is a bit more portable between character sets). I don't really understand the rest of what you mean. bob wrote: And again, what do you get when you click on your NEW MENU. The debug lists are clearly NOT showing ALT+0 or ALT+= as these would show up with 164+0 or 164+=. Ok now i have a problem. When i press the Action bar i see that it broadcast to 2 of my alt but the problem is my alt doesnt do anything. Can someone help me out please. It's not super clear to me what you are actually wanting to do. Your other slotted characters may not be doing anything because 1. they may not have a target selected, or 2. they do not have any in game skill bound to the key combination you are sending to the game instance. Currently you have two menus. You set the buttons on the Standard menu to target the character in Slot 3 of your character set. This means that if you click on the green boxes, or press the Hotkeys assigned to the menu (the 1 to = keys), then the appropriate menu button will send 1 to = to ONLY the character in Slot 3. 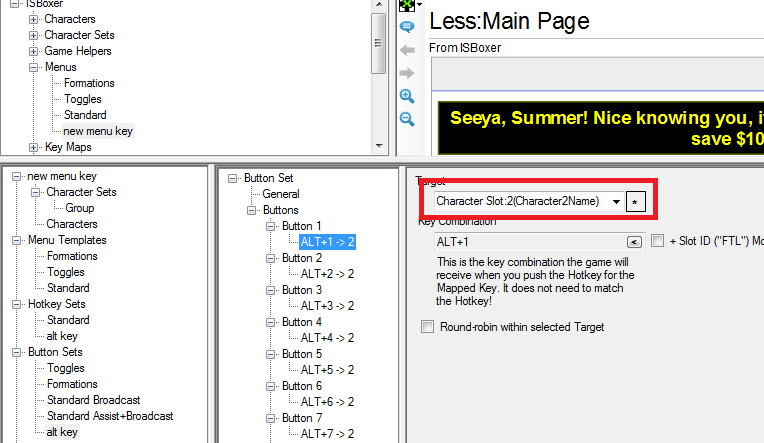 For the New Menu Key menu, you have set the target to the character in Slot 2 of your character set. You have also set this menu to be the ALT+1 to ALT+=, for both the Hotkey set and the resulting actions on the buttons. In other words, if you click on the green boxes for this menu, or press the ALT+1 to ALT+= hotkeys, then they will send the corresponding ALT+1 to ALT+= to ONLY the character in Slot 2. The ALT as referenced in the picture here is the ALT key on your keyboard, not alternate character. They way you appear to be trying to set it up is so you have a bunch of individual bars, which you can click on, or press Hotkeys for, that will trigger skills individually on different characters. This is a pretty inefficient style of multiboxing, but it is multiboxing, and a little more advanced that ALT+TAB. If you want a click interface, rather than a Hotkey driven interface. Don't set hotkeys on your menus. Your biggest issue will be if you want to use Hotkeys to trigger skills, then with an individualised setup as you are doing, you will run out of keys on the keyboard very quickly. If you want to have separate menus that send the same key to the individual characters, then set the buttons in each button set to do so. It seems odd that for your New Menu Key menu you are not just sending the standard buttons 1 to = in the button set. In your setup this is skipping the default skill bar that is normally configured in most MMO's. It is allowable to have button sets that send the same Key Combination to different game instances. Finally, if you keep going down this particular route, your will run out of screen space for all the menus you will have. In a general MMO, you can have 4 hotbars, or 48 buttons. If you create menus to control each one individually you would need 12 menu bars for your 3 characters. EQ has some other system of it's own, which IIRC will allow upto 150 or so functions, so you could get very crowded. If your problem is because your other characters do not have a target selected, then usually you have them perform an Assist prior to sending the actions on the buttons. There are two methods to this. 2. have the button execute the Assist Me mapped key first. You can see an example of this in the Standard Assist+Broadcast button set. Of course, this will only work if you have configured an /assist social as described here. bob wrote: It's not super clear to me what you are actually wanting to do. I understand what you saying and I wanted to head to that direction but problem is my knowledge of this program is very small. My ideal is I want to set the Action bar over my ingame hot bar so when i click my isboxer Action bar it will click my ingame hot bar for me from other toon. and with the ingame hot bar i can change the key to w/e i wanted. It seem i am doing it wrong because look like the Action bar is bind to my ingame spell instead if you can point me to the right direction i would be very appriciate or show me Thank you. You click the green box, it sends a Key to the target (a game instance). If you click on the first green box of the Standard menu, it will send the 1 key to the game. The in game key binding (or key mapping) usually defines what is associated with the 1 key. Normally this is the first box of the in game action bar. In most games, you can put whatever game skill you like on the first slot of the in game action bar. Whatever skill you put there will be executed.